If you were to ask us which is the most popular gaming PC platform in late 2017 odds are that we'd pick the Intel Z370 and 8th Gen Core processors. Refined, fast and now with more cores than ever before on a mainstream setup, it constitutes the base for our updated testing machines. 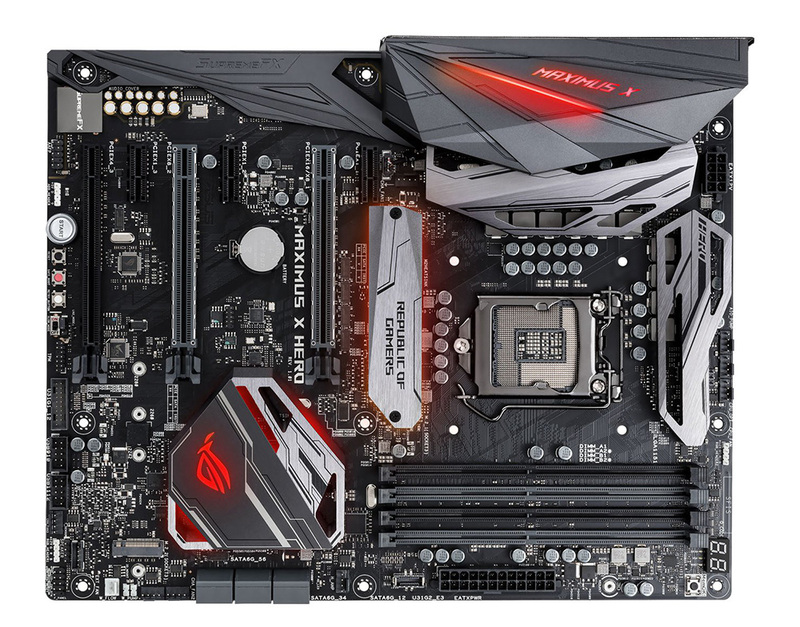 The motherboard choice is easy: Z370 is the only option for consumers looking to buy into the 8th Gen family. You can spend as little as £100 for a budget board that's fine at stock speeds, while £200 brings a few additional features and more overclocking-specific support into play. 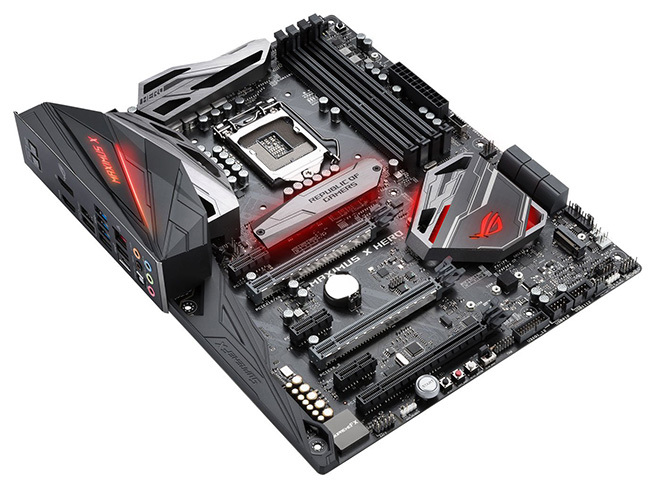 Stepping it up further, the £250 market is home to enthusiast boards, and industry giant Asus plies this segment with the Republic of Gamers (ROG) Maximus X Hero. Two such boards exist in the Maximus X Hero line-up: the standard one, reviewed here, and one equipped with 802.11ac WiFi that costs an extra £15 or so. Asus uses the existing IX Hero as a base and improves upon it in a couple of obvious ways. The first is the specific, thick M.2 heatshield sandwiched between the primary PCIe x16 slot and CPU, and we prefer this to the southbridge-integrated heatsinks on cheaper Asus Z370 boards. The second, as you will see later on, is an ever-so-cool I/O shield that's integrated from the get go. The board has many of the features that we'd want over and above what is provided by the chipset. There are a total of seven 4-pin fan headers dotted around the edges of the PCB and these cover both air and proper watercooling (up to 36W of power), with the latter even having flow-meter support for more esoteric setups. Asus expects you to overclock the CPU and use heavy-duty cooling with this board and rightfully equips it as such. Additional RGB support over and above the main zones is taken care of by a couple of Aura strip headers, one of which can control individual LEDs. Bear in mind that you have to install additional software in order to control the lighting and syncing with other Asus products and select memory - we would like it if Asus, like others, would offer such control in the BIOS. This would mean that the lighting is synched straight away, rather than waiting for the operating system and utility to load. The enthusiast features come thick and fast, with a useful number of buttons and switches at the bottom, though we would also have preferred the debug LED to be located in this area. As it is, high up the board and to the right, it can be obscured if you have a thick radiator in situ. Looking around, the board has multiple points where you can install optional 3D-printed material, too. Asus is sensible in adding USB 3.1 Gen 2 Type-C support on to the PCB and it keeps to six Sata ports down one side. Do appreciate that the lane-sharing limitations of the Z370 platform means that having both M.2 slots populated leads to a weird and wonderful array of what you can and can't use with respect to Sata. This is no different from any other Z370. One minor irritation is the hard-drive activity light located just above said Sata ports. The orange LED flashes regularly, which can be annoying if you have a side window. It can be turned off in the BIOS, but doing so switches all other LEDs off too, including the nice red glow surrounding the sporty Start button. Audio remains good (S1220 codec, solid software), the PCIe x16 slots are separated well, and there's a trio of x1 slots for lesser expansion. Having a full-length card in the topmost slot doesn't foul anything important either. We really do like the integrated I/O shield that is already fitted seamlessly over the various ports. USB 3.1 G2 Type-A and Type-C are both present and accounted, the clear Cmos and Bios flashback buttons are handy, while DisplayPort and HDMI are good choices for exporting onboard video. Could it do with a secondary LAN? Possibly, but its omission is no biggie in our book. About the only feature missing is Thunderbolt 3 over Type-C. Sure, it's becoming less common on motherboards, but it would help to separate this board from a glut of £200 models with ostensibly similar feature sets. The Maximus X Hero does feel like an upgrade over the already-decent Z370-F Gaming, and we appreciate the extra enthusiast touches and front-panel USB 3.1 G2 support. Asus has always been strong with respect to the BIOS and sensibly carries over the easy-to-use GUI from its latest boards. The only gripe, as we mentioned above but is worth repeating, is the lack of firmware-based control of the RGB lighting, relying instead on its all-encompassing Aura Windows-based software. Fan control remains class-leading, mind.